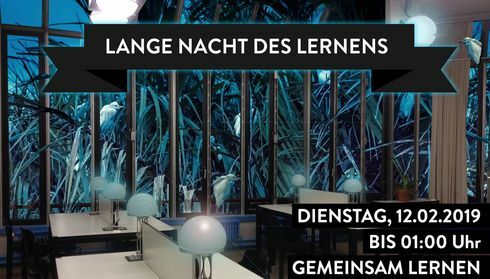 The University Libraries at the VOLKSWAGEN Building and the Subject and Department Libraries of TU Berlin will be closed from Friday, 19 April 2019 till Monday, 22 April 2019. 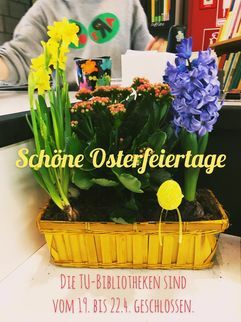 We wish you a happy easter holiday. Invitation to Semester Welcome Reception on Tuesday, April 9th at 6 p.m. Together with MATH+, the Institute of Mathematics invites you to our traditional semester welcome reception! 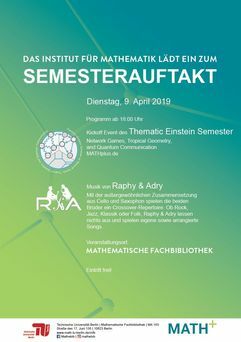 We open the first Thematic Einstein Semester of the Berlin Mathematics Research Center on Tuesday, April 9th at 6 p.m. and look forward to exciting live music from the band RAPHY & ADRY. The event is open to the public, no registration is necessary. Snacks and drinks will be provided. Berlins government decided to make the International Women's Day a public holiday. Please note, that the TU-Libraries are closed on this day! This is a good occasion to remember the exhibition Women of Mathematics throughout Europe - A Gallery of Portraits, that were presented in our reading rooms in 2016. Since then, the portraits were exhibited around the world, and will come back to Berlin in June, to a venue at FU. More details can be found here: www.womenofmathematics.net. 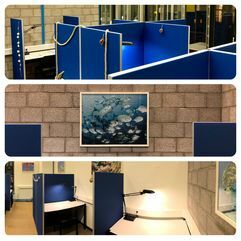 From now on we provide twelve new desks for concentrated single work in the library. Therefor one of our storerooms has been emptied, freshly painted and decorated. It is now called the "aquarium" and can be used during our opening hours. No reservertion is needed, but please clear up before you take a longer break. All desks have reading lamps and socket-outlets for your laptops. We cordially invite all students to our next Learning Night on Tuesday, the 12th of February, beginning at 8:00 pm.